Whole Mom's Marich Chocolates giveaway! One lucky winner will get Marich Chocolate’s entire gable box collection plus their latest chocolate & wine pairing favorites! 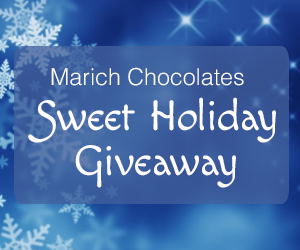 The entry period for the Marich Chocolates Holiday Giveaway from Marich Chocolates and Whole Mom is November 4, 2013 to January 18, 2014 at 11:59 pm PT.